Hi! I have been a counsellor for 1.5 decades now, both in Guatemala and in the UK. It is my honour to be able to work with people and be allowed to be a part of their world while they figure out their path in life whilst working through not so nice or ideal situations in life. I work to the needs of the client, in an integrative way, and I take the whole person into account when counselling each individual. 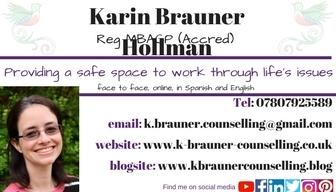 I look forward to hearing from you with our questions and to book a session if you find I might be the right counsellor for you! I also offer clinical supervision for counsellors in private practice.